Popcorn! But not just ANY popcorn. Oh no…. partially popped popcorn! It’s those little bits you get at the end of the bowl with part of the kernel sticking out. They’re sometimes a little hard on your teeth but they’re so crunchy and seem to have soaked up all the leftover butter and salt since they’ve been hanging out at the bottom of the bowl. It’s a whole BAG full of just that stuff! They still look like the kernels, but a little puffier. 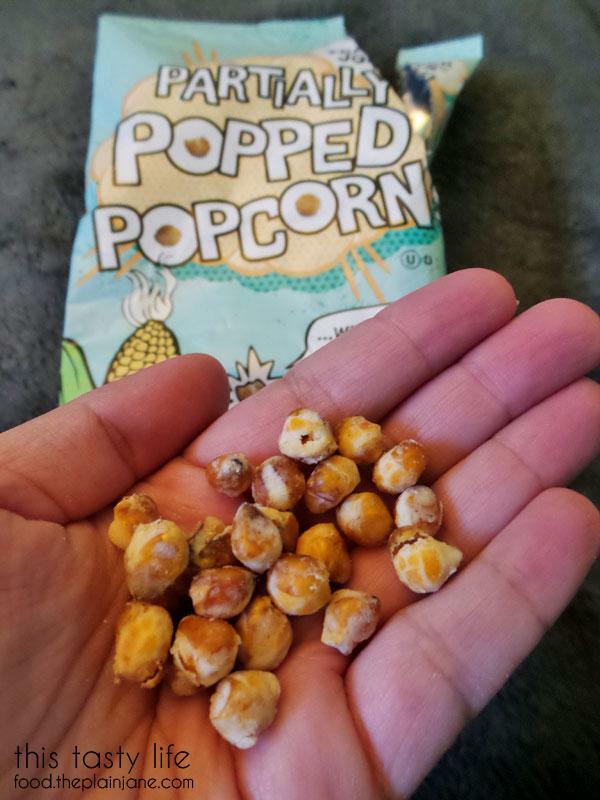 Amazingly these little suckers aren’t hard on your teeth (unlike the leftovers in your popcorn bowl). It’s kind of like eating popcorn and corn nuts together. 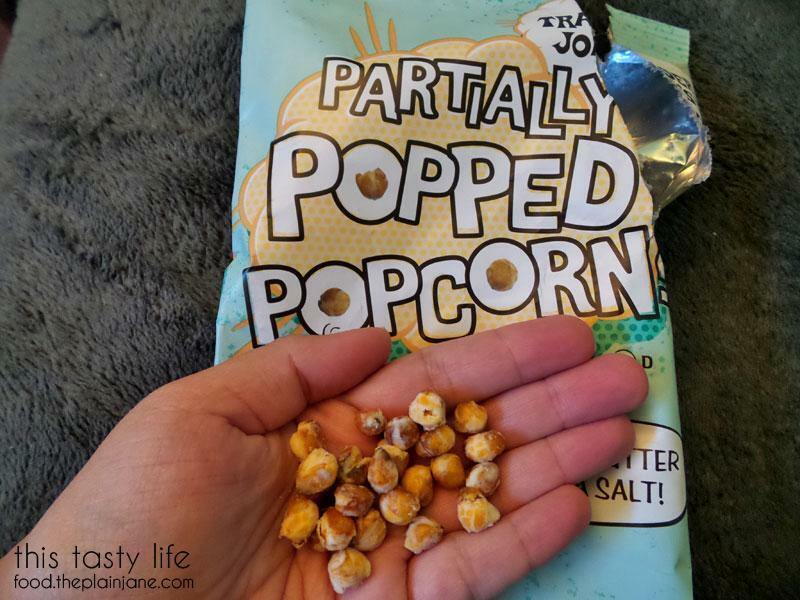 You get the crunch of a corn nut but the flavor, taste, and slight puff of the popcorn. They’re buttery and have the perfect amount of salt. I find them to be MAGICAL (and dangerous) since I just want to keep munching on them! We’ve already finished off the bag at our house and I need to go out and get another bag. Or two. Or three. Hey, don’t judge. The only down side (if you can call it a down side) to eating the partially popped popcorn is that they’re so crunchy they cancel out all other noises. Basically, don’t watch your favorite show while eating these – you’ll miss all the dialogue! Thankfully there’s DVR for that. Ooh, I need to find this item! it looks like fun. I always want to eat those partially popped ones left in the bowl but they are too hard so I stop after one or two. this is perfect. I wonder if TJ has a team that’s sole purpose is to sit there and brainstorm these things. I know! They usually feel like they’re going to crack my teeth. I read that the kernels are steamed and then popped which kind of makes me wonder if I can try it at home…. hmm! Seriously, their brainstorming team must have a lot of fun! This is weird and awesome and I can’t believe someone though to come up with it. Haha. Seriously, who thinks of these things?! One of those bright lights someone had, I tell you. The best part is that these don’t crack your teeth like the leftovers in your popcorn bowl, haha. Interesting product. I’d give this a try. What a funny product b/c these kernels are usually the ones I leave behind in the popcorn bucket! They always seem to be super hard and get stuck in the tooth somehow. Yeah, the partially popped ones in the bowl are usually way too hard but THIS product is different because now you can totally eat them without breaking your teeth, haha. If you’re into super crunchy things like I am, then these are deeeeeelicious. When I saw these in the Fearless Flyer I knew I had to try this – and I LOVE them. Very addictive – I have eaten two bags by myself – wondered if they would break my teeth, but so far I still have all my choppers!! Very buttery and salty and I need to go get some more soon. Thank you so much for all your interesting and delicious food items – love, love, love Trader Joe’s.